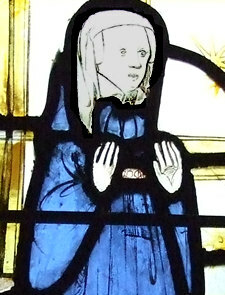 These details are from the panels of the ‘Pricke of Conscience’ window in the church of All Saints, North Street. 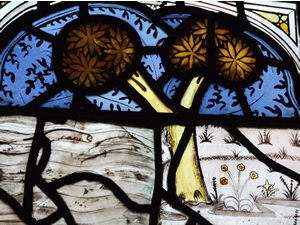 Dating from around 1410, it’s an apocalyptic vision of rising seas and sea monsters, the earth on fire, fruit trees burning. A man and woman lie in bed as the figure of death – a loathsome-looking skeleton with a spear – stands beside them. In the bottom panels, kneeling figures with bewildered and fearful expressions look on, as the window’s scenes depict the last fifteen days of the world. I knew this was a famous stained glass window, but to me that wasn’t a guarantee – I’ve seen many generally admired things and been left wondering why they’re generally admired. Not in this case. 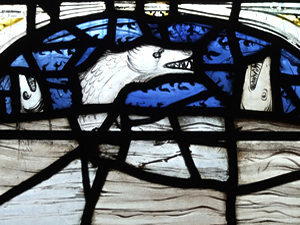 The window includes a condensed and paraphrased version of the text of ‘The Pricke of Conscience’ – a Middle English poem – as captions to the panels. Despite studying English Literature – including Middle English – I have to confess I wasn’t familiar with this text. Later, I found a copy of the poem (see links below). It is of course intended as a moralistic work, a call to repentance, and is clearly an illustration of medieval terrors. 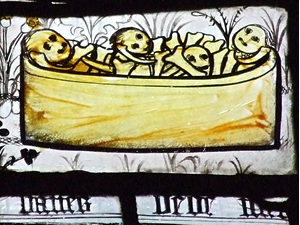 Yet more than any other stained glass I’ve seen, it seems in many ways a moving illustration of terrors that are timeless, and indeed strangely reflects our own, more recent concerns, about the fate of the world, climate change and rising seas: ‘The se sal ryse, als the bukes says’. 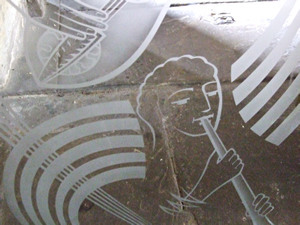 Rather more cheerful, indeed heartwarming, is the ‘Corporal Acts of Mercy’ window nearby. 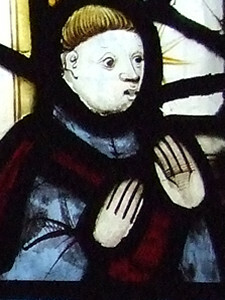 Another medieval work, it illustrates part of St Matthew’s Gospel. The Acts of Mercy include feeding the hungry, giving drink to the thirsty, clothing the naked, visiting the sick and relieving those in prison. Here the kind bearded gentleman on the left is visiting prisoners in the stocks. 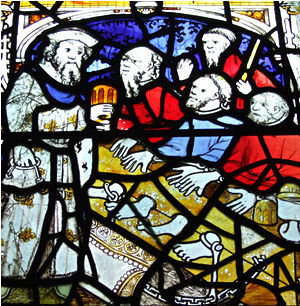 Compared to the ornate, more sophisticated Victorian stained glass we’re probably all more used to seeing, there’s something very touching in the way these medieval windows reflect common humanity – like here in the hands and bare feet of the prisoners. In another panel, the same gentleman is visiting a poorly chap who is lying in bed under a flowery cover. It’s all rather homely and reassuring and comforting, after the apocalyptic ‘Pricke of Conscience’. Modern glass here, in the lobby to the church, beautifully decorated but in a rather less colourful, more restrained and stylish modern way. 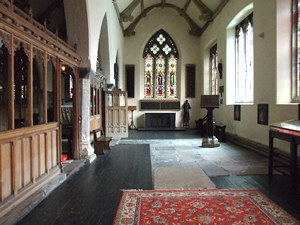 I didn’t notice this until I left, being so curious about the medieval interior I could see through these glass doors. All Saints, North Street is the only church – apart from our Minster – that I remember visiting as a teenager, just out of curiousity. I can’t remember, all these years on, why I was curious, perhaps it was just that the door was open and I was passing. 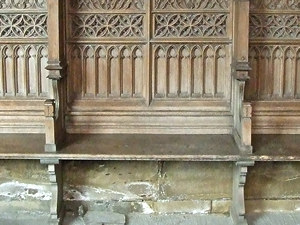 It really does feel like a medieval church, and it has an atmosphere I can’t quite find the words for. I remember finding it atmospheric and moving all those years back, and though I’m older and more cynical now, it still felt like a special place. You don’t have to be a believer to see that when people believe, have faith, have commitment, they make beautiful things.